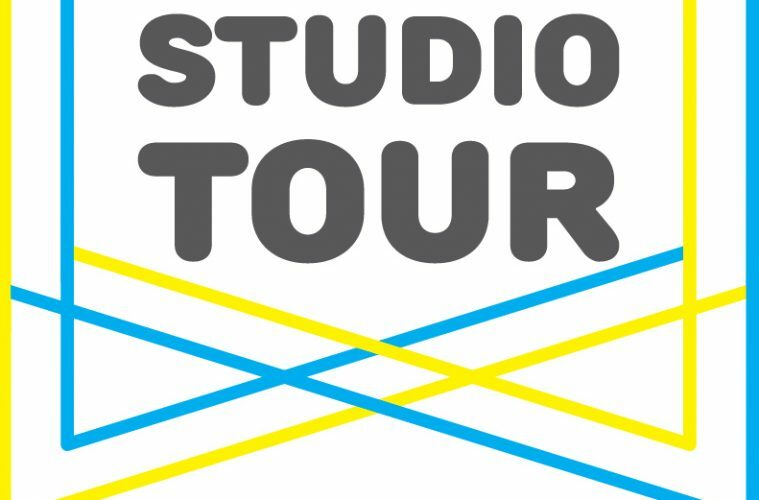 The Baltimore Office of Promotion & the Arts is proud to announce School 33 Art Center’s 30th Annual Open Studio Tour! 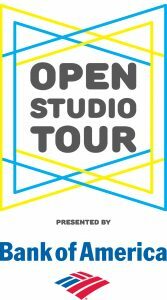 An annual city-wide event, Open Studio Tour has brought together professional artists and the general public, giving collectors and art lovers the opportunity to visit the studios of visual artists. 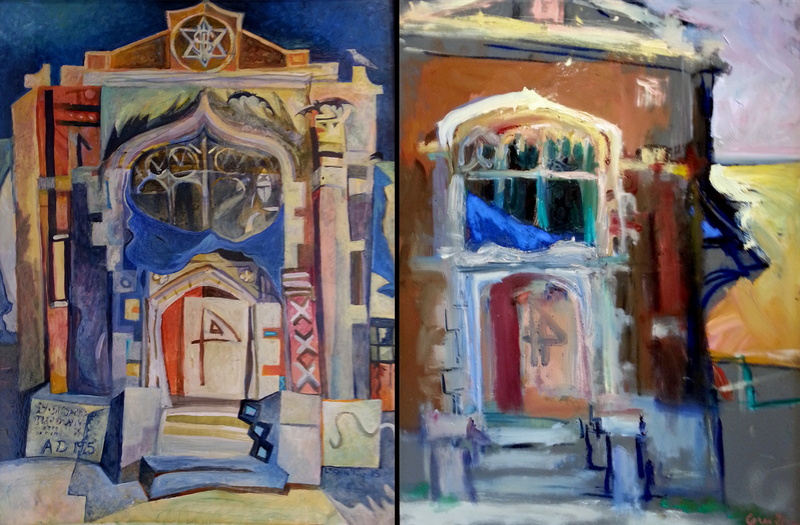 Traveling from throughout Maryland and the surrounding region to visit the studios of artists in Baltimore, visitors get a chance to meet the artist, see their work and a behind-the-scenes glimpse into their working processes. On October 13th and 14th, take the opportunity to share your work with the public and with other artists during this event. If you have a studio at either Bromo Seltzer Arts Tower or School 33 Art Center, please do not use this application. Email Flannery Winchester at fwinchester@promotionandarts.org for information on how to register. 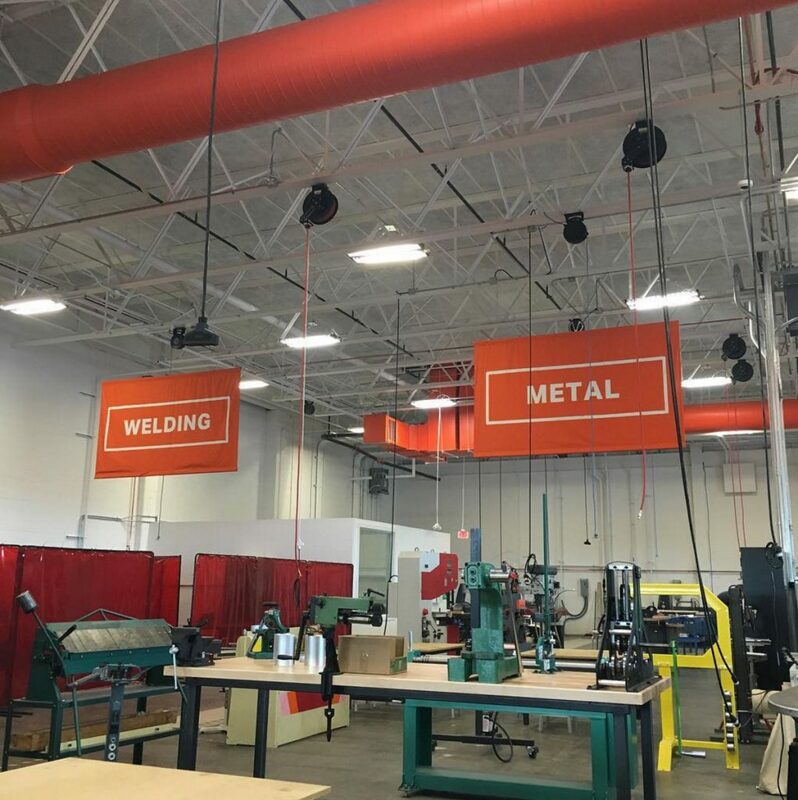 Each year, School 33 Art Center seeks to highlight the arts in Baltimore’s unique neighborhoods through the Open Studio Tour Community Spotlight Award, which supports neighborhood kickoff events in selected communities. This year’s Community Spotlight is Baltimore’s Cherry Hill neighborhood. On Friday, October 6 at 6pm, the Youth Resiliency Institute will host an artist reception featuring a number of Cherry Hill-based artists. A panel discussion focused on the intersection of community self-determination and the arts as well as equitable access to the arts in Baltimore City will follow. This free event will take place at the Cherry Hill Community Center on 2700 Spelman Road. We interviewed two artists participating in Friday’s Community Spotlight event, Mighty Mark and Dallas the Dollmaker, about their work and the arts in Cherry Hill. CLICK HERE to view the Cherry Hill Kickoff event page. Photo courtesy of Mighty Mark. 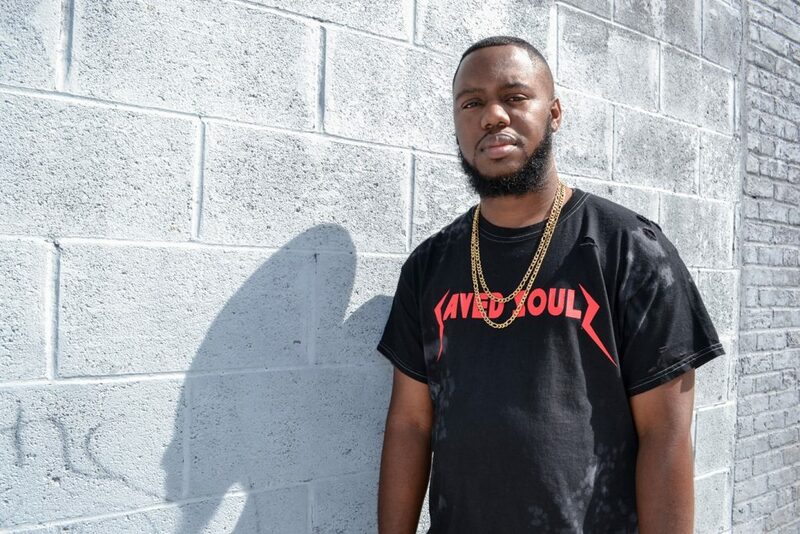 Born and bred in Baltimore City, Cherry Hill-native Producer and DJ Marquis Gasque AKA Mighty Mark, is the new torchbearer of the urban dance music genre known as Baltimore Club Music. Successfully bridging the gap between the intensity of old school club music and the futuristic style of the new school, his crisp production serves up unexpected but delicious combinations of urban vocals and chants, 80’s synths, 90’s drum samples and heavy booming 80s. These elements melt into thumping bass lines, making your pulse race and your body move. Each carefully crafted track is an individual work of art. Mighty Mark’s original releases and remixes receive frequent airplay via Rinse FM, BBC Radio and Radio One FM Stations and with each release his fanbase increases as people catch on to the wave. With recognition and features via respected publications such as Complex, Vice/Noisey and Earmilk, the future is looking bright as Mark continues to DJ in Baltimore’s most popular venues, create club anthems and curates music on his label Zoo On Mars Entertainment. Can you tell us a little bit about the work that you do and how you got into producing music? I’m Mighty Mark, mostly known for Baltimore Club Music but also hip-hop, R&B, all kinds of styles of music. I’m from the Cherry Hill area, right down the street from this recreation center where we are now. I’ve been producing since about 2006, when I was in high school. When I was living in Cherry Hill I used to volunteer here at this recreation center with Ms. Shirley [Foulks] of the Youth Resiliency Institute, so I used to go in the computer lab and make music and beats with the kids and make club music with them. I used to help run the after school program Monday -Friday and then during the summer I helped with the summer camp for 5-6 years. I’ve seen a lot of the kids grow up and get jobs and some go off to school. Being an artist has changed a lot even since I first began. In my music, I try to be true to myself and not follow trends. I try to give back to the community whenever I can, and also have culture surrounding my music. It’s not a gimmick, there’s always something more behind it. Even in the tracks that you see people dancing to, there’s really something deeper behind them as well. If I go to work, I work at Comcast, so if I’m really mad about something at work I go home and make a track. It might end up sounding angry or something, but it’s really a way to relieve the stress as well. Being an artist just means really expressing yourself on a musical level. Do you think that working with the Youth Resiliency Institute has influenced your art? It definitely has, because I’m more of a sponge—I like to have people around me when I’m creating. I’m not the type of person to say “Hey I came up with that, it’s all my idea.” And the youth always know what’s fresh and hot. I’m 28, so I’m getting old, but they’re something like 14 or 15 years old. When I started producing I wasn’t even making club music until I got to the recreation center—started seeing the kids dancing to it and playing it at parties and that sort of thing. That actually got me into Baltimore Club Music—this neighborhood right here. How would you describe the arts community in Cherry Hill? There’s not necessarily a place for artists here to gather, but there is a lot of talent here. And people find out how to make things out of nothing. There are a lot of skilled dancers and people that go into modelling and more, so the arts help to bring the community together. But we definitely lack in resources for people to gather, as well as basic tools—computers, microphones—things that people would need to record. But the arts may keep some people off the streets for a few hours and prevent them from doing things that they don’t want to do. Would you describe this community center as a place where people come together? Yeah! So the community center has always been a place to gather—it’s probably one of the longest open community centers in Chery Hill. Especially with Ms. Shirley [Foulks], she’s always had her doors open for anyone to come in—even just after school when you’re hungry she’d provide you snacks and anything of that sort–probably coming out of her own pockets. Is there anything you want people to think about coming into the panel discussion that will take place at Friday’s kickoff event? I really want parents or even leaders of the community to understand how important artistic outlets and artistic recreation can be for a child, as well as just how important music can be and how it can tie in to brain development and brain stimulation as well. Not even just music, any type of art. I feel like the arts have kind of taken a back burner. So even if you have the ability to put your child in a piano class or take them to a dance class—something of that sort. Even if you know how to dance and want to come here to volunteer, really if you have any artistic skill and you’re not just using it for yourself, you can share it with the world and share it with the kids as well. Cherry Hill just had their inaugural Cherry Hill Festival recently, and now you’re having this neighborhood spotlight event. Do you see these as a way to kick start some of these conversations? I definitely do. That was the first annual Cherry Hill Festival. I had the opportunity to DJ and my artist, TT the Artist, had the opportunity to perform. And during my set I brought two artists, who were born and raised in Cherry Hill—during my set they performed songs that I produced. I definitely think that it’s a step in the right direction and I think it’s going to be something big going on for years to come in Cherry Hill. Dallas the Dollmaker with his Demon Series at the Cherry Hill Community Center. 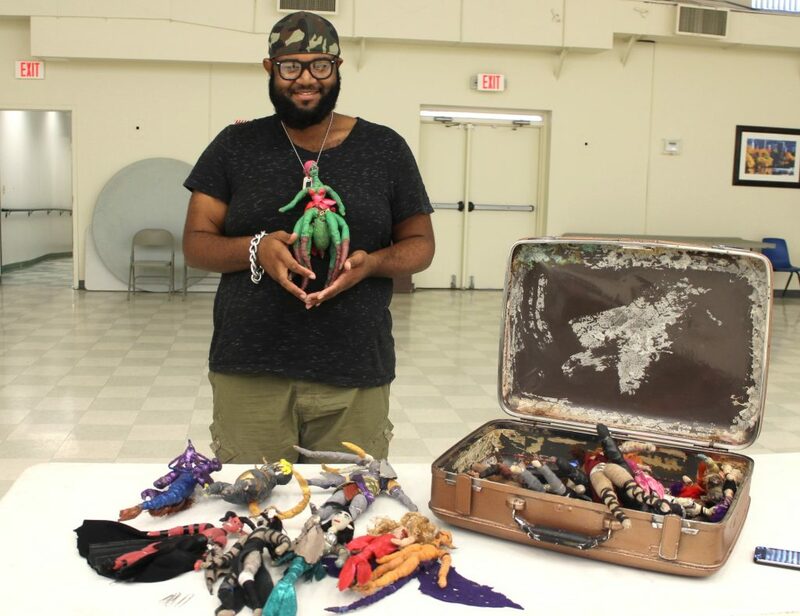 When Dallas the Dollmaker met me at the Cherry Hill Community Center to do this interview, he was kind enough to bring along a suitcase full of his creations to show me in person. There had to have been at least thirty dolls in that suitcase, each designed and created with great attention to craft and detail and each with its own intricate back story. The collection of dolls that Dallas brought with him was his Demon Series, and he tells me that his next series will focus on Angels. It is hard to describe the feeling of picking up each of Dallas’s dolls, one by one, and marveling at its features while hearing from the artist about how he designed and crafted it, which found materials he used, and how its character fits into the fantasy-based world that he has created. Attendees to Friday’s Community Spotlight Event will have the opportunity to meet Dallas, view his artworks up close, and learn more about the Demon Series. In addition to creating these works, Dallas is also a skilled photographer and writer. The artist also works with young students through summer programs and workshops, teaching them the art of doll making and inspiring their creative practices. How did you first become involved with the Youth Resiliency Institute? I first got involved this summer. I was introduced to them by Ms. Stewart (one of the many case workers at Cherry Hill Homes–she is so awesome, I love her so much) and I honestly didn’t know I would even be a part of anything that they were doing. I was just told that they needed help with the Cherry Hill Art & Music Festival. So I thought that meant helping them with set up and if they might need anything made, but I had no idea that I would actually be in the festival. I had the chance to put my art work on display as well as show children the creative process that goes into my art work. That is how I became involved with YRI and I hope to continue to be involved with them and work on more projects as well as events. Can you tell us how you began creating your dolls? I got started creating dolls in middle school when my art teacher, Mr. Walter, was showing us how different cultures make toys and gave the class a project to make our own dolls. I’m a bit of a perfectionist so I was determined to make one that was presentable. We had a week to turn in our finished project, so I worked really hard and it payed off because when it was my turn to present what I made my teacher was blown away. It was just something that I ended up loving and thought it was great way to bring my creations to life. What is something that you think is special about Cherry Hill? Cherry Hill has it’s good times and bad, but what I think what make is special is how close the community is and how some of the older kids and adults look after the younger kids to make sure nothing happens to them. I find that to be very cool. Is there any advice that you would give to a young artist? Always stay true to who you are and love what you do. What are you most looking forward to during the kickoff on Friday? I just hope everyone is super pumped because I want people to feel the energy in the room and to have a great experience. 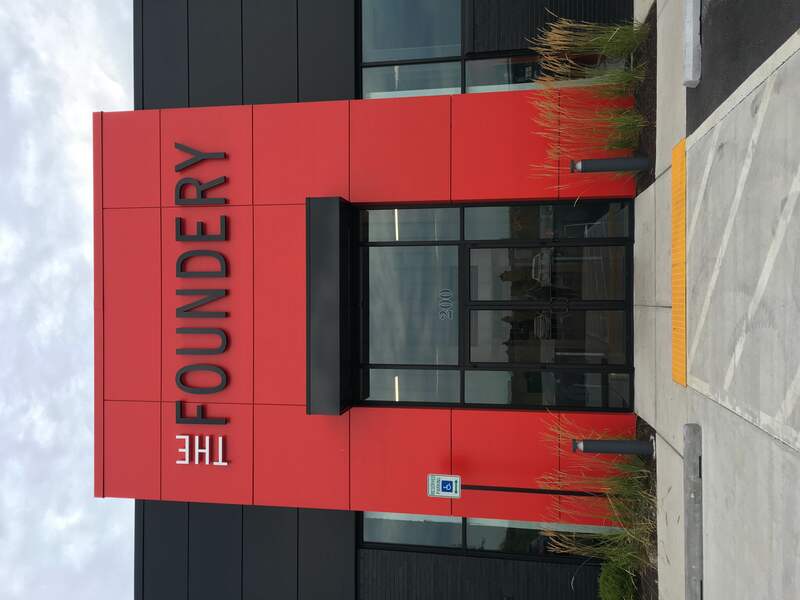 Can you tell us a little bit about The Foundery? 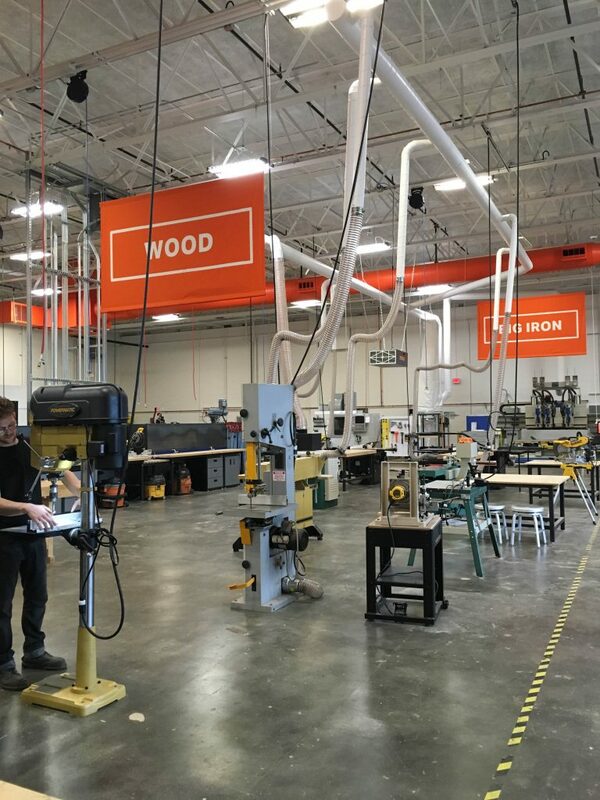 The Foundery is an industrial-grade makerspace equipped for woodworking, metalworking, blacksmithing, textiles, 3D printing, Computer Design, and CNC machine work. We will teach you how to use machines and then give you access to them! We wanted to create a space for Baltimore’s vibrant maker community. We offer a broad range of mediums so that there is something here for everyone. What is something that is unique about this space? We have a full blacksmith shop that we offer classes on. 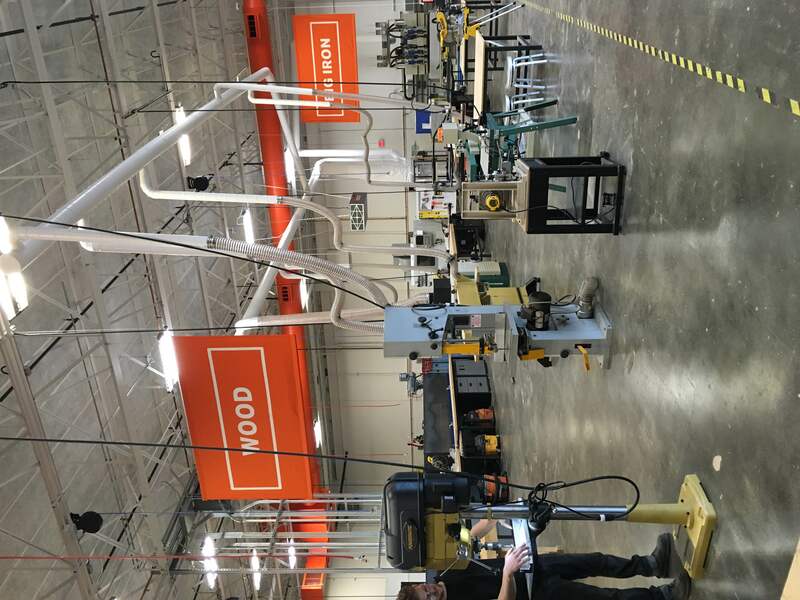 We also have large-scale production CNC machines that allow you to really crank a product out. What is one thing you love about being in Baltimore? We love Baltimore. It was born from industry and we take great pleasure in honoring that heritage – by crafting more makers right here in South Baltimore. 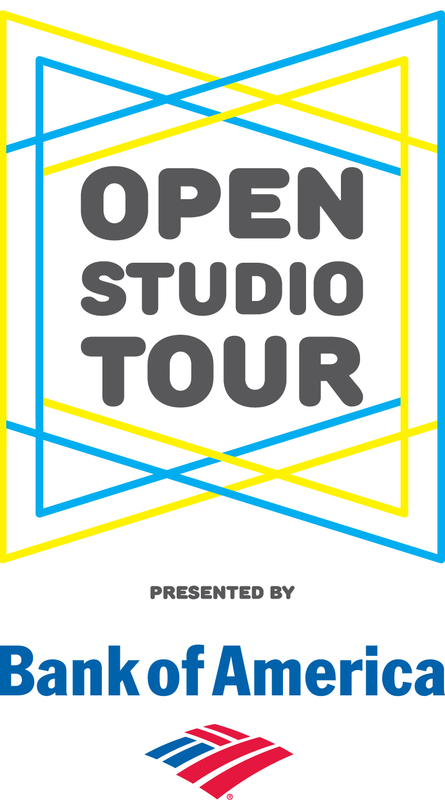 What are you most excited about for this year’s Open Studio Tour? 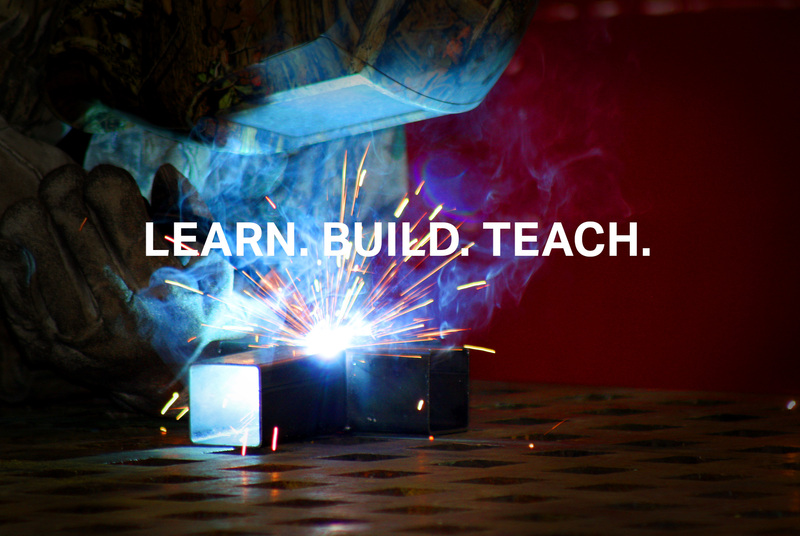 We are excited to meet new people and show them what they can learn! 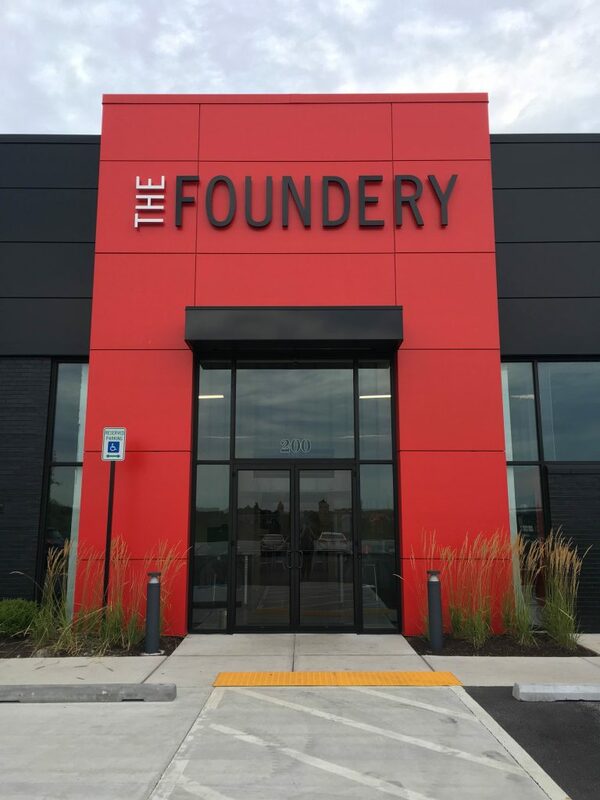 Visit The Foundery, located at 101 W Dickman St. in Port Covington, on Saturday & Sunday, 10am-3pm! There will be workshops and demos on both days for visitors. A tribute to Wink will take place all weekend with a celebration of his life and a show of his photography and fantastic woodworking projects. Wink’s first studio was at Load of Fun on North Ave. in Station Arts North – almost before there was a Station Arts North. He traveled in the US extensively for the Park Service, but always returned to Baltimore, with its eccentric, mischievous energy. Wink and Susan Walters worked together on projects for C-Kat Studios. They are both talented woodworkers- creating beautiful Arts and Crafts style furniture and frames, often using reclaimed wood. Wink was also a dedicated photographer, capturing both action shots of CycloCross races and the vast beauty of the land preservation projects he was working on. Please come celebrate Wink and his beloved C-Kat Studios with us. 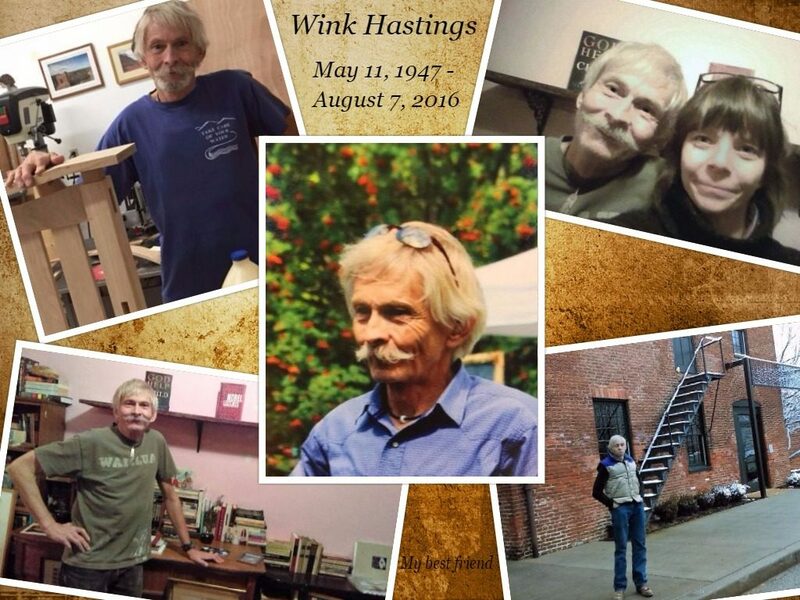 Ward “Wink” Hastings died entirely too soon at age 69 on August 7, 2016 in Baltimore, MD after battling pneumonia. Wink has remaining family in New Hampshire, Maine, and Hawaii, a tremendous network of friends in the greater Baltimore area, and colleagues throughout the country. Born in Massachusetts in 1947, Wink spent his childhood in New England and moved to Utah to attend Utah State University where he earned a Bachelor’s Degree in Landscape Architecture in 1974. Wink was a true champion for public and private land conservation and had a distinguished 42 years of service with the USDA Forest Service, Bureau of Reclamation and Bureau of Land Management. In the late 1980’s, Wink joined the National Park Service’s Rivers, Trails and Conservation Assistance Program as a Landscape Architect in Milwaukee, later moving to Atlanta before finally ending up with the Chesapeake Bay Program in Annapolis, Maryland. In Atlanta one of the many projects he worked on was a plan to commemorate route of the 1965 Selma to Montgomery March as a National Historic Trail. Family, friends, and colleagues will remember Wink as a conservationist, a photographer with an acute eye for the natural world, a talented woodworker, an extreme skier, rock climber, cyclist, hiker, kayaker, and competitive amateur triathlete. He was physically tough as nails, gentle in soul and heart, and in tune with popular culture. Wink was a gentle and kind friend with a wry sense of humor, the best storyteller, a life enthusiast, and an impeccable gift giver. In recent years, Wink was a regular volunteer teaching meditation at the Maryland Women’s Prison in Baltimore and studied at Wonderwell Mountain Refuge, a meditation and retreat center in the Buddhist tradition in New Hampshire. 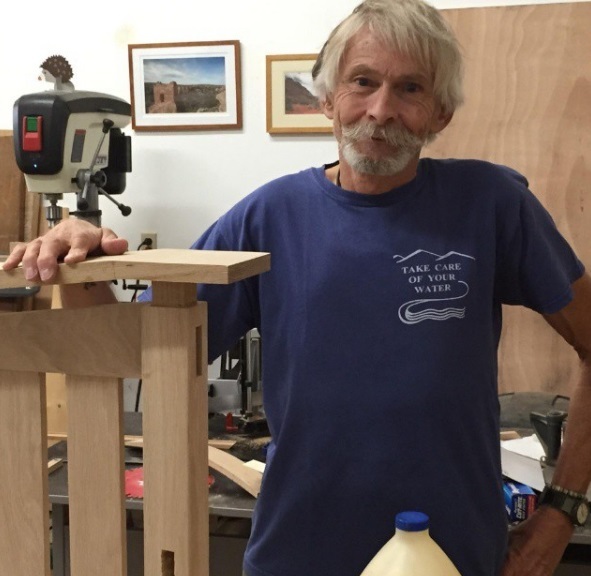 He enjoyed building and designing beautiful frames and furniture at C-Kat Studios in Woodberry, named after his constant cat companion Cinnamon. American Chestnut trees will be planted by friends and family in his honor. Wink was well loved and will be sorely missed. Please join C-Kat Studios in Parkdale Building 1 in this tribute to their studio mate, Wink Hastings, on Saturday & Sunday, 10am-6pm. They are located at 3500 Parkdale Avenue in Suite Q. 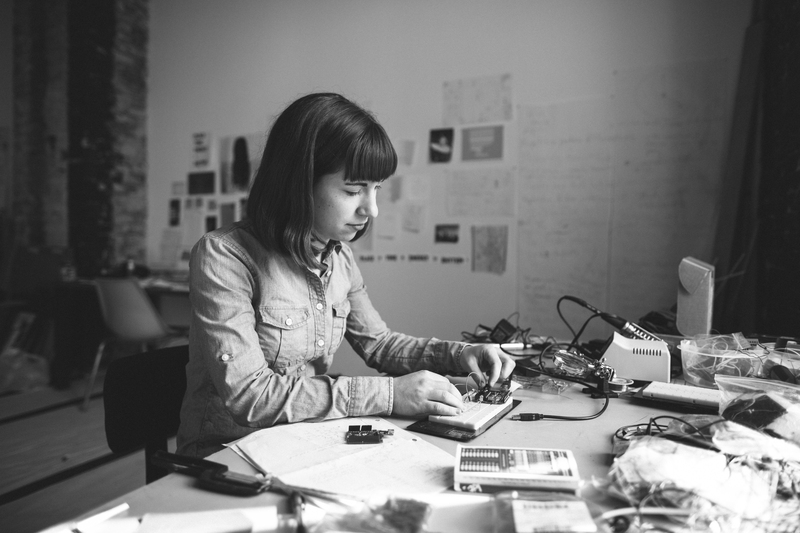 Can you tell us a little bit about the work that you do in your studio? 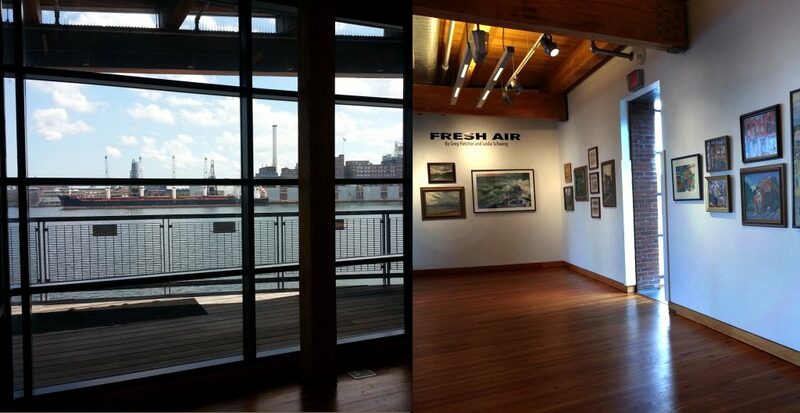 The Herbert Bearman Gallery at the Frederick Douglass-Isaac Meyers Museum is a lovely venue on the third floor of the museum overlooking the Baltimore Harbor. Currently we are featuring the exhibition “Fresh Air”, New works by Greg Fletcher and Leslie Schwing. What drew you to the medium(s) that you are currently working with? 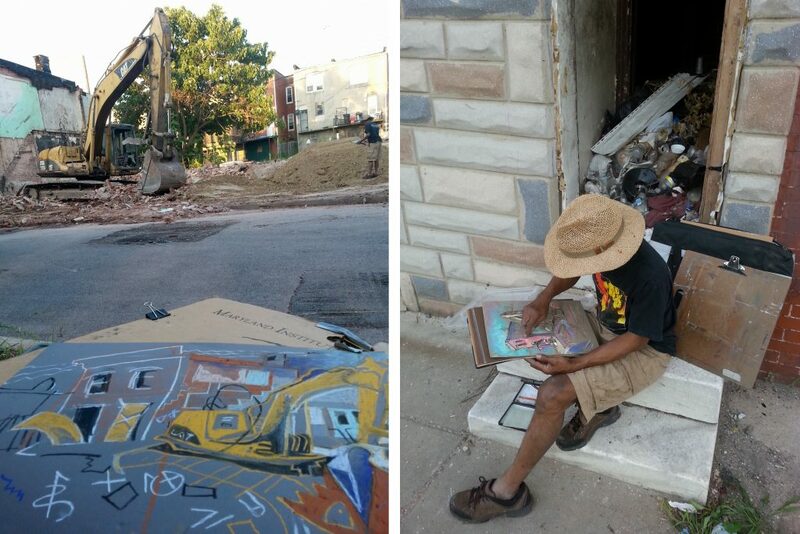 This husband and wife artist team paint Baltimore City from a fresh and intriguing perspective. They focus on the hidden, the obscure and often ignored places revealing a sense of magic and wonder. From the spiritual to the humorous one is always surprised when looking at their work. What is something that you think is unique about your studio or practice? Fletcher and Schwing go out daily to find their subjects. They begin their paintings at the site, often spending hours amidst rubble and decay, as if on an art picnic of their own, with their dog Pablo Picasso in tow. They then return to their separate studios and weave the works into final form which display distinctly different visions. They have been working this way together for over 20 years. What is one thing you love about being an artist in Baltimore? Baltimore is so full of talent and vision. We at the Herbert Bearman Gallery feel fortunate to be able to share the works of these artists with our visitors. This is our first year opening to the School 33 Tour. We look forward to seeing you all. 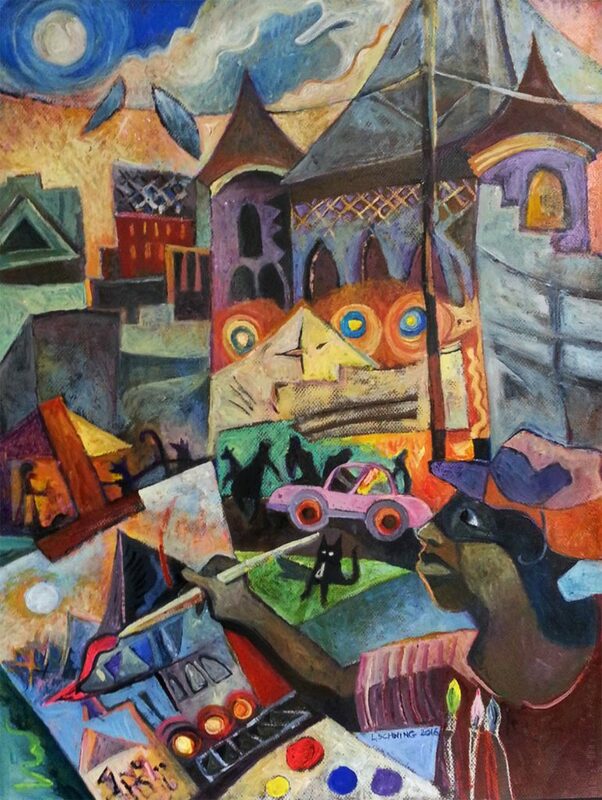 The Herbert Bearman Gallery at the Frederick Douglass-Isaac Meyers Museum will be open on Sunday, October 9 from 12pm-6pm, located at 1417 Thames Street! 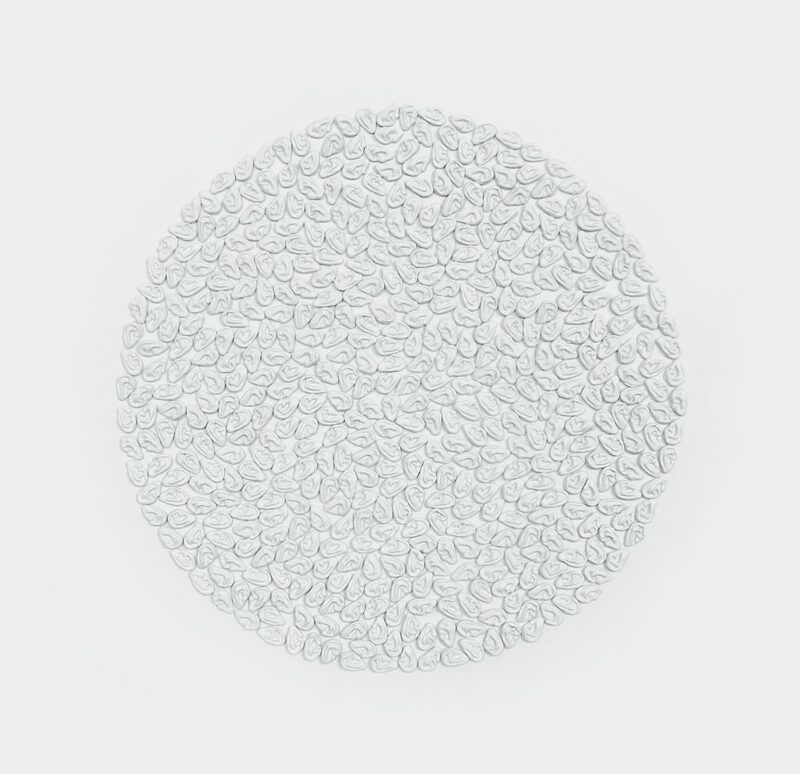 I often take a multimedia approach, using sculptural objects, musical performance, video, and interactive electronic technologies to investigate the dynamic acts of listening, communicating and moving. Most recently though I’ve been obsessed with using doll push molds to create hundreds of tiny ears and feet out of clay. I find the repetitive process of using these molds very meditative. 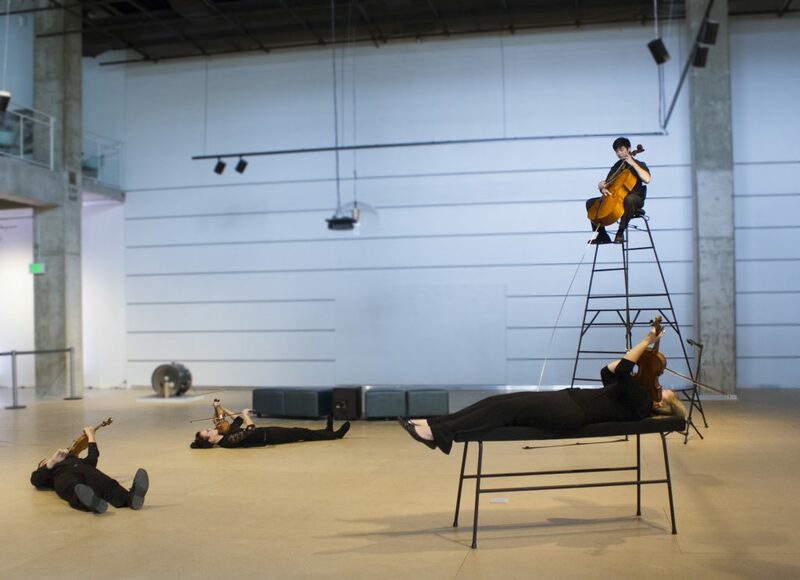 Philosopher Henri Lefebvre’s text, “Rhythmanalysis”, has inspired this latest body of work as he writes, “He listens—and first to his body; he learns rhythm from it, in order consequently to appreciate external rhythms. His body serves him as a metronome.” In Lefebvre’s text he further explains how the body is the first point of analysis when it comes to interpreting the myriad of rhythms that surround us (e.g. social, cultural, musical, biological, environmental). 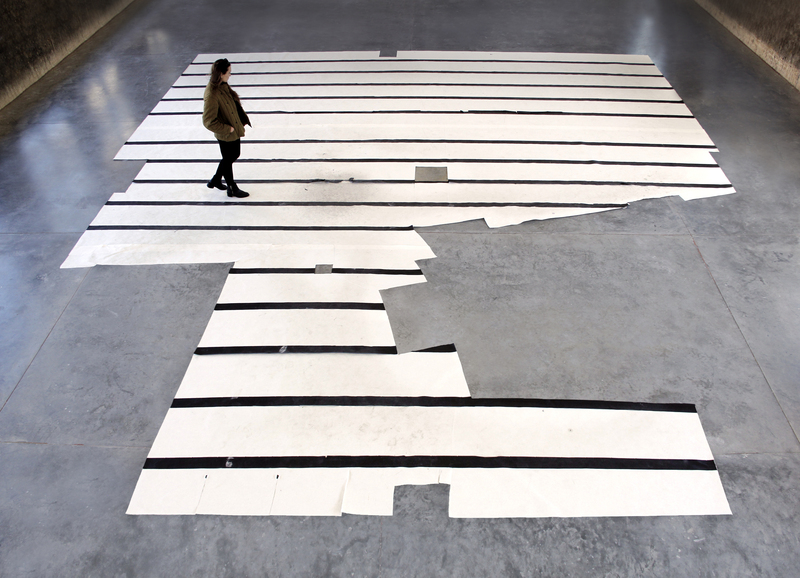 I use devices such as repetition, absurdity, and collaboration to filter in the physical rhythms and movements of the body created by the accumulation of footsteps, breaths, and heartbeats. These tools work together to place the viewer in the here and now, and create spaces to “just be”. Typically, in my practice using one medium naturally leads to using another, such as using video to document a performance. In 2015 I participated in 3 residency programs that led me to explore more portable mediums such as photography and mold making. (When living nomadically, it’s hard to think large scale). I gravitate towards using so many mediums because there is a certain creative freedom that comes with working in a naïve nature. You do not become weighed down by what previous artists in that medium have done, or get caught up in having correct technique, or discard ideas because you think it’s not possible/feasible. I love to collaborate with people in other fields. I’ve done projects with composers, poets, luthiers, and programmers. Right now I’m on the lookout for an experimental dance troupe to work with. Having the freedom and support to experiment. Seeing what other artists are up to, and having the chance to get some feedback on what I’ve been working on. The entrance to the parking lot of the studio building is marked by black barrels. Once you turn into the lot, you will see a concrete ramp on your right. The entrance door to the studios is at the top of the ramp. You can park at the top of the ramp or at the bottom of it.